Thank you for yet another fantastic drumming workshop. The children have thoroughly enjoyed the session today and are really enthusiastic about the follow-up work that we have planned with other percussion instruments. From the beginning to the last moment, every child was focused on the task and keen to pick up the new rhythms that you introduced. We will look forward to seeing you again next year! Is your school looking for an exciting drumming activity for your children. Find out more about our African Music Experience workshops or contact us now to create a beat sensation at your school! 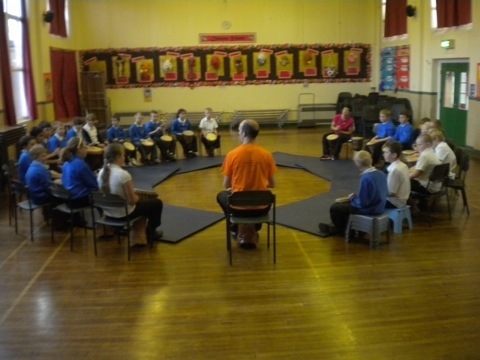 Unbeatable Energy provide African drumming workshops for schools in Lincolnshire, Nottinghamshire, Derbyshire, Staffordshire, South Yorkshire, West Yorkshire, Greater Manchester, Staffordshire, and Warwickshire.